It can sometimes be a messy and disappointing business cooking pancakes. For every triumph that gracefully flips in the air, there are those casualties that haven't been so lucky. They might have missed the pan and ended up on the floor during an ambitious flip, burnt to a blackened crisp or been so undercooked as to be stodgy and gooey. For such an easy recipe, a perfect pancake is anything but simple. That's where the Breville VTP130 comes in. This innovative appliance helps you prepare perfect pancakes that you can be proud of. And not just pancakes. Get creative and experimental with French crêpes, American-style buttermilk pancakes, Indian poodas or Russian blinis. Or ditch the pancake theme and whip up an omelette or a flour tortilla. The options are plentiful. 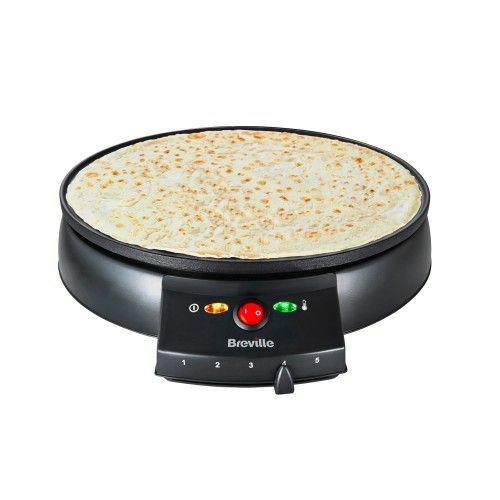 The Breville VTP130 Traditional Crêpe Maker is a 30 centimetre (cm) wide circular cooking plate made from aluminium with a non-stick coating for easy cleaning. In fact, there's no fiddly dismantling required to wash the plate after use, simply wipe clean with a damp cloth and it's ready to use again. It boosts an impressive 1000 kW of power and has a variable temperature control with five settings, giving you the control to heat to your requirements. The plate rapidly heats up and after less than three minutes is ready to go at a medium setting. There are power-on and ready-to-cook indicator lights which both light-up when the appliance is switched on. Once it has reached the chosen temperature the green ready-to-cook light will go out giving you the visual prompt to get started. Then simply ladle your mixture onto the cooking surface using the accompanying ‘T Stick’ spreading tool to help effortlessly spread it across the plate for even and thorough cooking. And when ready, remove from the plate and serve. The Breville VTP130 comes with fitted cord storage to keep your kitchen work-top clutter-free and if stumped for inspiration there's an accompanying booklet packed with fun and inventive recipe ideas that are both sweet and savoury. So whether you're a kitchen novice or a pancake pro, there are plenty of scrumptious suggestions to get you using your Breville Crêpe Maker. Breville is the leading brand of small home kitchen appliances in the UK, with a hugely successful range of products across the spectrum of kitchen appliances including kettles, toasters, irons, blenders, food processors, microwaves and many others. Breville's success is driven by innovation and design, as well as a determination to provide great looking, high quality products that meet the demands of every kitchen in the country.